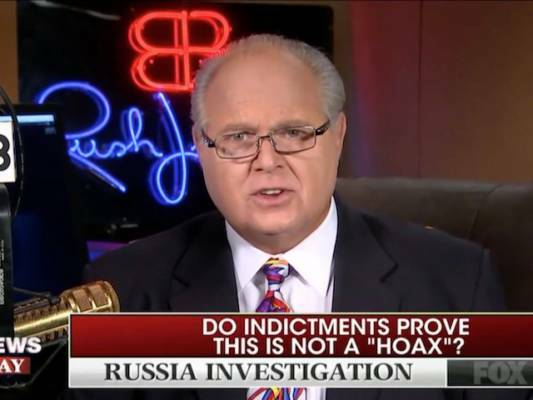 Limbaugh said, “You realize as far as many Americans are concerned, every election going forward is not to be tainted depending on who wins and loses it. If the if the Democrats win, everything will be fine, you’ll never hear a word about tainted elections. In fact, the next time Democrats win the House or the Senate, pray tell the White House you’re probably going to hear one of two things: ‘Yeah the Russians were still trying to help the Republicans, we found out about it this time and we were able to overcome it and the Russians are going to be trying every election but we Democrats have found a way to beat them back. Vote for us, we can control the Russians, we’re not in bed with them,’ Blah blah.